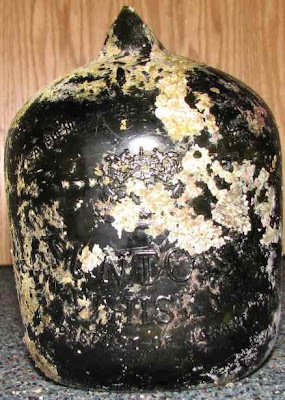 There is a story behind this whisky bottle. 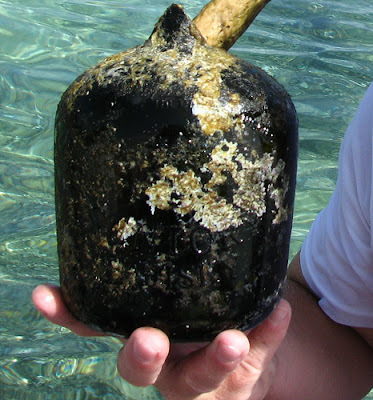 It was recovered near a submerged World War II tank in the Marshall islands by this chap. The Marshalls were fought over by the Japanese and the Americans in the war and there are relics from that fight scattered all over the islands. I think we can date it a bit more precisely than that. The early bottles in this line bore the slogan: "A Blend of Ancient Whiskies". That was still on the bottle until at least 1968. 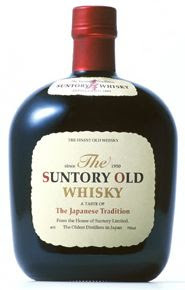 The first bottle with "A Blend of the Choice Whiskies" I have found is the 1994 "Suntory Old Whisky - Mild and Smooth". Was it chucked in the water by some Japanese tourist? (Update: Unlikely, says the chap who found it: "There are no Japanese tourists out here. For that matter there are no tourists out here from anywhere. The only way to get out here is if you work or are from here.") Was it bought by a local or was it washed ashore after being jettisoned from some cruise liner or perhaps it floated all the way from Japan itself? It is a different kind of story from the romanticism of a doomed Japanese soldier taking a final sip before meeting his fate but it is symbolic in its own way: of Japan's rampant post war prosperity. Smells of marmalade and varnish with very faint earth and undergrowth notes slightly complicating things. The taste is quite nice: a very thin caramel with grainy harshness and plastics peeking through, but very suppressed. Just creeps above the two star threshold, but barely. Though a blend, it is too pricey to qualify for the Mizuwari Death Match. All pictures of the recovered bottle used with the permission of Island Life. Barbara, did you get an answer. I have an unopened bottle that says est 1899 also but it has a red cap. has to be more than 40yrs old because my grandfather supposedly brought it from Japan. Its in mint condition. 180ml Suntory Limited. 180ml rather than a full bottle indicates to me a newer produce, but I have nothing to back that up. Is this similar to the bottle you are talking about? If so, I would guess post-mid 1960s, probably later. suntory international Los Angeles, California on the seal of the lid. It looks old.Numbered 248912302. Distillery at Yamazaki, near Kyoto,Japan. Like I said the bottle has never been opened and I can not find a date on it anywhere. I have read a few of you comments and find similar bottles but not this discription. Do you have any help for me on this? It includes bottles that sound similar to yours. 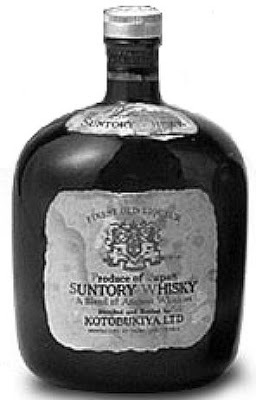 We came across a bottle of Suntory Old Whisky when cleaning out our parents house. Unopened, the decanter is in the shape of a rabbit with flowers on it. any ideas on the year, etc.